For everyone else, today, July 16, 2018, is Amazon Prime Day. And a fun time is to be had by all, I’m sure. But to me, July 16, no matter the year, is Snowball Day. If you’ve explored this site at all, you know that cats have played a huge part in my family’s life, both the family I came into the world with and the one I have created with my spouse. This cat story is with the original family. My dad was from Pennsylvania and every so many years, his two week vacation was spent as a car trip back to his home. My mother, it should be noted, was never going to live north of the Red River which divides Texas and Oklahoma, so the trips were necessary if Daddy was going to maintain any connection. There are many memories tied into these long road trips, but the favorite brings us Snowball in July. Visiting my Aunt Pauline on her farm, my mother spotted a beautiful long-haired, black barn cat. I’m sure he was a barn cat because Aunt P wasn’t about to have that critter in her house. Besides, as Daddy assured us often, cats were supposed to live in the barn and earn their keep. (He might have espoused this while letting a cat lick his cereal bowl while sitting on the counter. The cat. Not Daddy.) Anyway, having spotted this lovely creature, my mother blithely told Aunt P to send him to her. Two weeks later, on July 16, home and having forgotten the incident, my mother receives a call from the central train station in Dallas to the effect of, “Lady, come get your cat.” Yes, indeed, they’d caught my mother’s delight, packed him in a crate with food, water, and some sort of pink straw, and shipped him to us via rail. We hastened to get him. Mother, I think, was surely surprised and never dared her sister-in-law on anything else. l remember the question was: Could we keep him? Well, how could we not? Was Daddy going to ship him back? But my sister and I were young and the deal was made. We could keep him if Daddy could name him. 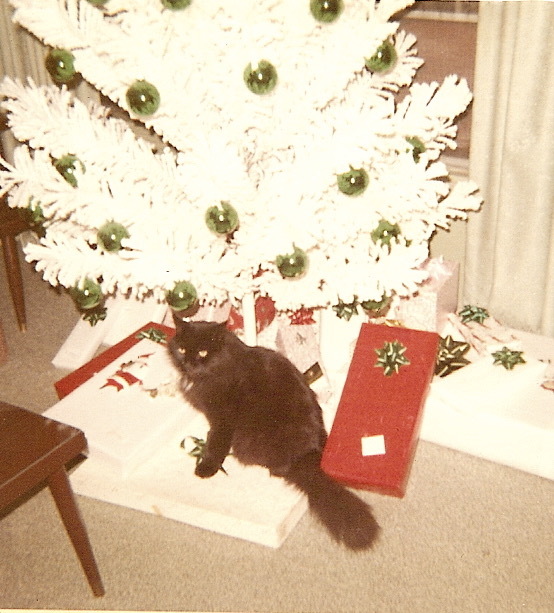 And the name of the black cat with the white spot on his chest was to be Snowball. We introduced Snowball to our young kittens by keeping him in the garage with only the screen door separating him from the house. Within the week, he had met the kittens and soon took to holding them down and cleaning them tip to tail. It wasn’t long before he ruled the neighborhood and the dogs therein, taking to sleeping with the one next door in his dog house should Mother not have been able to corral him up for the night. I don’t quite remember when Snowball died but probably while I was in college. He was a good cat and one we loved. And one I do remember every July 16.